The U.S. government’s prohibition of alcohol in the 1920’s had the unintended effect of making the fortunes of some of the nation’s most notorious gangsters. A decade later, Hollywood’s exploitation of the violence and drunken depravity of the Prohibition-era jump-started the careers of several of the screen’s most popular leading men, including the immortal James Cagney. Cagney first found his way to the screen in Sinner’s Holiday (1930), a film adaption of Penny Arcade, a play in which the young vaudeville hoofer turned actor had starred as a bootlegger. Warner Brothers originally hired Cagney to a three-week contract to replicate his stage performance in this single film, but after witnessing his natural screen presence, they hired him to a seven-year contract. Four films later, Cagney starred in another vehicle about Prohibition bootlegging, The Public Enemy (1931). It would launch the diminutive tough guy to superstardom. Based on an unpublished novel, Beer and Blood, The Public Enemy contains plenty of both. It tells the story of two friends from working class families, Tom Powers (Cagney) and Matt Doyle (Edward Woods), who find that petty theft is more lucrative than working a regular job, like the one held by Tom’s disapproving brother, Mike (Donald Cook). When World War I erupts, Mike is one of the first to volunteer, but Tom stays behind to support his Ma (Beryl Mercer) through his thievery. Prohibition provides Tom and Matt with an even more lucrative criminal enterprise--running bootleg beer. The public’s thirst for illegal alcohol brings Tom and Matt wealth, semi-respectability, and loose women. Unfortunately, it also brings violence and hails of machine-gun fire when a rival gang tries to move in on their territory. Watching The Public Enemy today, it is obvious that James Cagney was destined to be a star. His performance as Tom Powers is brutal, electric, and charismatic, and he has a naturalism that outmatches his more experienced costars (most of whom come across as stilted, hammy, or both). However, Cagney almost didn’t get to play the part. Edward Woods was originally hired as Powers, and Cagney was supposed to play the supporting role of Matt Doyle. Fortunately, director William Wellman recognized that Cagney was the more dynamic of the duo, and he swapped the actors’ roles after filming had already commenced. It was a genius move, because Cagney absolutely dominates the screen with his forceful performance. No matter what awful things Tom Powers does in the film, from smashing a grapefruit in Mae Clarke’s face to gunning down men in the back, you can’t help but root for him, because Cagney is so appealing. The movie itself has aged well. 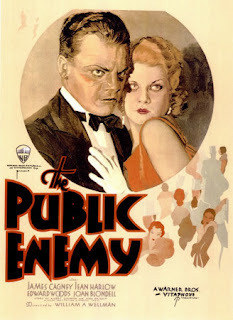 Unlike many films of the early Thirties, there is nothing static about The Public Enemy. The camera is constantly moving, the camera placement and compositions are imaginative and effective, and the movie advances at a brisk pace. The picture has also lost none of its power to shock eighty years after its original release. The Public Enemy is one of the best movies Hollywood ever produced about the Prohibition era. It should be considered essential viewing for lovers of soused cinema. 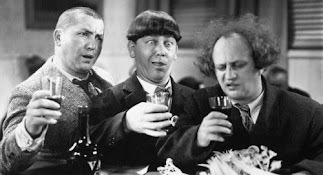 Potent Quotables--TOM: Ain’t you got a drink in the house? KITTY: Well not before breakfast, dear. TOM: I didn’t ask you for any lip. I asked if you had a drink. Video Availability--The Public Enemy is available as a standalone DVD or as part of the Warner Gangsters Collection Volume 1 (DVD) (6-Pack) . Similarly Sauced Cinema--Cagney gets pulled into the bootlegging business again in The Roaring Twenties (1939). Miss Trivia App on Sale: Firstly, cocktail goddess and friend of Booze Movies, Cheryl Charming has a iPhone/iTouch/iPad drink trivia app, Miss Trivia, which contains 5000 questions in five fizzy categories. One of the categories, "Celebrity Cocktails," is specifically centered on adult beverages in film. For a limited time, the app can be purchased at a special discount price of just 99 cents. You'd be fool-hearty not to buy Cheryl's app at that price, so let's show her some love. 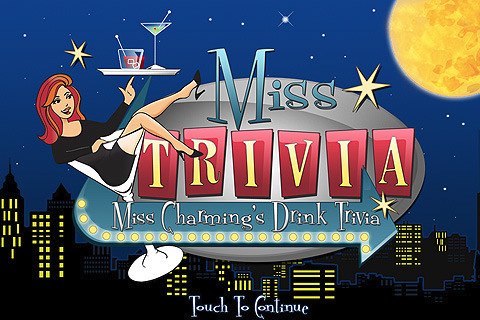 You can find more info and a download link for Miss Trivia at http://www.misscharming.com/app.htm. Soused Summer at the Cineplex: We're only a few weeks into the summer movie season (summer apparently starts in late April now), and we've already been treated to some alky-centric gems. We've witnessed the god of thunder drink Stellan Skarsgård under the table in Thor, Will Ferrell has portrayed a down-on-his luck boozer in Everything Must Go, and Kristen Wiig has gotten pickled on a plane in Bridesmaids (all of which have garnered good reviews). This week Johnny Depp returns to the role of rum-sodden Captain Jack Sparrow (although the early word has been decidedly disparaging for Pirates 4). This is quite a promising start for a soused summer at the cineplex. Now, if they'd only start offering cocktails at the concession stand, we'd really have something. 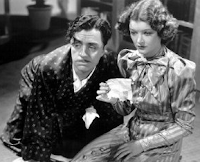 The Thin Man Greenlit: Speaking of Johnny Depp, I posted an item back on October 30th that the actor was interested in rebooting the classic Thin Man series with director Robb Marshall. 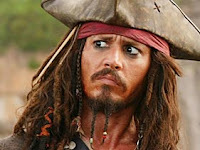 Apparently, the picture is going forward with Depp portraying the perpetually potted Nick Charles. There's no word yet as to who is being considered to play Nora, Nick's loyal wife and drinking companion. Of course, Depp has remakes of Dark Shadows and The Lone Ranger (as Tonto) scheduled ahead of The Thin Man, so Nora's casting is likely a long way off. While I can't imagine any two actors capturing the same kind of electric chemistry that William Powell and Myrna Loy displayed, the idea of this remake doesn't fill me with disgust in the way Russell Brand's take on Arthur did. I like Depp, and with the right Nora (Winona Ryder, perhaps) the project could be a tipsy treat.